Archibald was born on 3 December 1885 at Windsor, Berkshire, the youngest of the six sons of stonemason Thomas Tavender (1851-1913) and Harriett née Puttick (1853-1887). Thomas originally came from Montacute, some four miles west of Yeovil, but married Harriett in Battersea, Surrey, in 1874 and the couple settled in Lambeth, Surrey, from then until 1884 when they moved to Windsor where their two youngest sons were born. In the 1901 census Archibald and his older brother Edgar were living with two maiden aunts, Mary Ann and Ellen Tavender, both dressmakers, in Montacute. 16-year old Edgar was an apprentice carpenter and 15-year old Archibald was an apprentice stonecutter. In 1907 Archibald married Olive Newton in Yeovil. After their marriage the couple lived in Percy Road where they had three children; Edna May (b1908), Dorothy Marion (b1910) and Douglas Ewart (b1911). Archibald enlisted in February 1917 and arrived at HMS Pembroke 1 (shore base), Chatham, for training. He became an Ordinary Seaman of the Royal Navy and his Service Number was J67088. From his Service Record we know that Archibald was 5' 5" tall, had a 35" chest, dark brown hair, grey eyes and a fresh complexion. He also had a scar from an operation for appendicitis. On 28 March 1917 he was posted to HMS Hannibal which was moored in Alexandria, Egypt. Archibald was in transit aboard the HM Transport Arcadian as it was sailing between Salonika and Alexandria. The Arcadian was a Barrow-in-Furness built passenger liner constructed in 1899 by Vickers, Sons & Maxim Ltd for the Pacific Steam Navigation Company as SS Ortona. In 1910 she was converted to a cruise ship. She started her first world cruise in January 1912, the largest dedicated cruise ship in the world at that time. In February 1915 Arcadian was taken up by the Admiralty and converted to an armed merchant cruiser. On 7 April 1915 at Alexandria, General Sir Ian Hamilton came aboard and used Arcadian, together with the battleship Queen Elizabeth, as his headquarters ship during the opening phase of the Gallipoli Campaign. Once Hamilton's staff had transferred to a shore base at Imbros, Arcadian was employed as a troop ship in the Mediterranean. On 15 April 1917 Arcadian was en route from Salonika to Alexandria with a company of 1,335 troops and crew, including Archibald Tavender, and escorted by a Japanese Navy destroyer. Shortly after completing a boat drill, while 26 miles north east of the Greek island of Milos, Arcadian was hit by a single torpedo from the German submarine SM UC-74 and sank within six minutes with the loss of 279 lives, including 32-year old Archibald. It was reported his "body was not recovered for burial". A contemporary newspaper article described how four of Arcadian's overcrowded lifeboats were successfully lowered before she sank. The escorting destroyer had two torpedoes launched at her while she was attempting to rescue men from the water; survivors reported that she had lowered three of her own boats while going "at full speed". More survivors, who had been clinging to a raft, were rescued at midnight by the Q-ship HMS Redbreast. 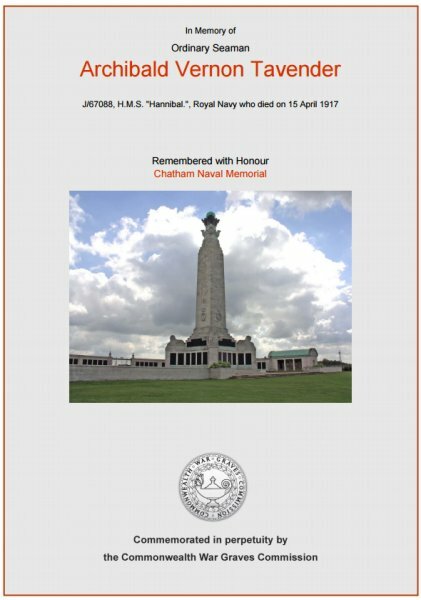 Archibald Tavender's name is inscribed on the War Memorial in the Borough and on Panel 22 of the Chatham Naval Memorial. The Commonwealth War Graves Commission certificate in memory of Archibald Tavender. ©© 2014 - 2019 Bob Osborn. All rights reserved.